If you are traveling the backroads in southern Colorado’s Sangre de Cristo Mountains, you might stumble upon this monument to one man’s (Jim Bishop) perseverance, dedication, vision and hard work. More than forty years ago Mr. Bishop started building this castle by his own hand. It is not intended as a dwelling place, but rather as a monument to poor, hard working people. Working alone, and with the donations from some of the visitors, this eccentric man has personally handled every stone in the structure, mixed the mortar and milled the lumber. 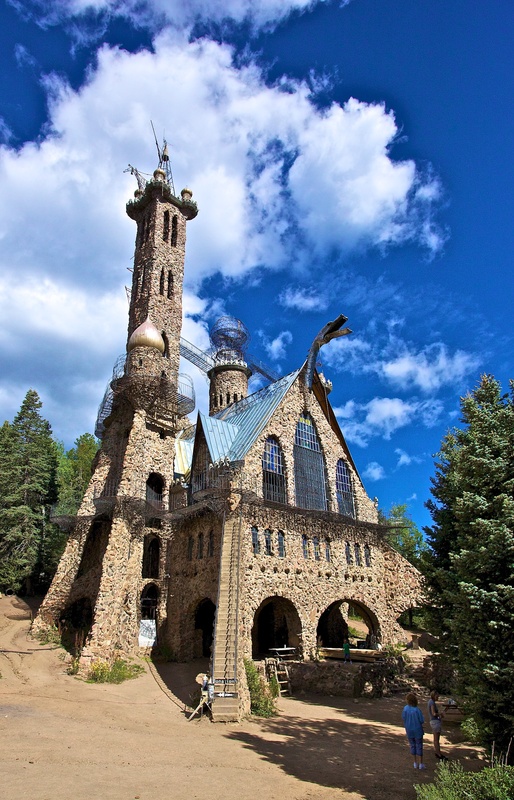 The castle is at a 9,000 foot elevation, so work can only be done in the short summer season. Mr. Bishop works at a wrought iron business in the winter months to support his family. His iron work can be seen in the railings and lattice works of the castle. This is still a work in progress and I hope his health continues to see it’s completion. It is truly amazing to see what one man can accomplish when his mind is set. I will confess, I was only able to climb Sooo high in the structure. It is really scary to get up near the top of those towers! Click the image to see more of the detail. There was no one else around while we were there. You are free to go anywhere, such as the crude inner spiral steps to the tops of the towers. One is tall as a sixteen story building. A very striking image, and such an impressive structure.